I love it when everything is organized. No really, I do. Unfortunately, I need a little help sometimes to get there. 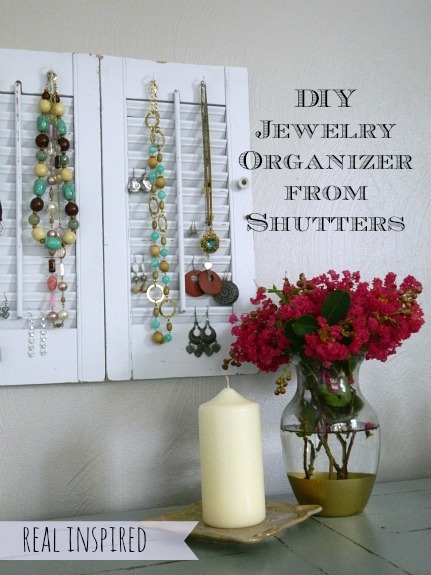 Like this shutter jewelry organizer. I was desperate for a jewelry storage solution and this little shutter upcycle works perfectly for me. I haven't had any issues and it's held up great. I even remember to put my jewelry back on it most of the time. Like I said, I need a little help sometimes. Not too long ago, I put together a board of recycled pillow ideas on Hometalk. Hometalk is similar to Pinterest but it's solely for the home and garden. Perfect for house nerds like me! Well, I've also recently put together a shutter upcycle board! 19 great ideas for reusing old shutters! How awesome it that? You can click on the picture or the link above to view the board. If you are already on Hometalk, you can follow me here. I'd love to connect with you there!